Blog posts have been appearing that quote Ambassador Sidi Haji Abdrahaman from Tripoli in 1786, in the era of the Barbary pirates, saying that it is the “right and duty” of Muslims “to plunder and enslave” any who did not acknowledge the Prophethood of Muhammad “and that every [Muslim] who was slain in this warfare was sure to go to paradise.” This message proffers the quote as evidence that the attacks on American ships by the Barbary pirates were a reflection of a scriptural command for eternal war with nonbelievers and that, for that reason, Thomas Jefferson “declared war on Islam” in response. The virus, virus in more than one sense of the term, is an instructive example of how context-dropping can be used to advance a completely fallacious political position. Yes, the ambassador made a Bin-Laden-like statement, but Jefferson, who had George Sale’s translation of the Qur’an, knew his statement doesn’t represent accurately the Qur’an’s position on just war, and Jefferson’s subsequent attacks on “the shores of Tripoli” (as they have been memorialized in the “Marines’ Hymn”) were neither a war on Islam, nor even on all Muslim states, as basic knowledge of the history of the Barbary Wars demonstrates. Here is the context of the events, a context of which the Islamophobes appear ignorant and, in any case, prefer that the rest of us be ignorant. In that time the practice of encouraging “privateers” to attack enemy ships was common. (The U.S. Constitution provides for it in the authorization of “letters of marque and reprisal”.) Britain was paying tribute to the Barbary states for the protection of British ships traveling in the south Mediterranean. This protection extended to ships coming from the American colonies which were under British control. Once the U.S. broke free from Britain, the British were quick to advise the Barbary states to whom they themselves were paying tribute for protection, that the former colonies were no longer under British protection and fair game for the pirates. Some, but not all, of the Barbary states took the bait. The Sultan of Morocco Mohamed Ben Abdullah had initiated friendship with the U.S. in 1777, when no other country in the world recognized the U.S. as an independent nation, by guaranteeing safe passage through the Straits of Gibraltar where pirates plagued maritime trade in the belief that Christendom was at perpetual war with the Muslims. The sultan recognized that the nascent American nation was different from the European imperial powers, and evidently hoped to keep it that way by befriending us in our time of need. Grateful for the Sultan’s intervention on behalf of the newly declared American nation, in 1783 Benjamin Franklin, John Adams, and John Jay urged the U.S. follow up by negotiating a perpetual treaty with Morocco, which was signed in 1786 and ratified by Congress in 1787, beginning a friendship that has lasted without interruption until this day. 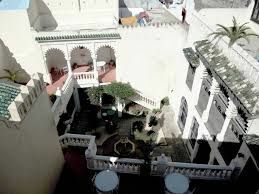 (A sign of the respect accorded the U.S. in Morocco is the presence until today of the Tangiers American Legation Society and the beautiful building in which it is housed in the old city of Tangiers, shown at left.) 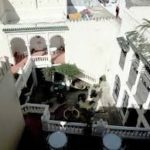 Clearly the Moroccan state has for over two centuries had a different understanding of Islamic law and the common values of the Muslim world and the American nation than that of the ambassador for Tripoli. Just as clearly, that Jefferson understood this is reflected in the fact that his first action was not to urge war, but a negotiation. The real issue for Jefferson was not over the nature of Islam, but over the advisability of paying tribute. Muslim states were not the only states that demanded tribute of client states. (Such tribute is called not Islam-geld, but Dane-geld, as in “once you have paid him the Dane-geld, You never get rid of the Dane.”) Unlike Congress, Jefferson wished to build a strong Navy so that we could protect our own ships rather than pay tribute to a protector state. Algeria’s infidelity to the treaty of 1796 was due not to religious fanaticism compared to Morocco, but to the fact that “Algiers was much more dependent than Morocco on the fruits of corsairing.” Not religious enthusiasm, but greed for the things of this material world sparked the Barbary Wars of the early 1800s. Not a religious mandate, but a state of war was behind the hostilities in the period. The war was with Tripoli and not with the the other Barbary powers, let alone with the Muslim world or Islam itself. Jefferson sought only to fight aggression and embraced the end of the war in 1805; it was his political opponents who wanted to prolong the war to effect a regime change in Tripoli by reinstalling Hamet Qaramanli as Pasha. Seven years of peace were ended when war broke out between Britain and the U.S. in 1812. The new Dey of Algiers saw an opportunity to increase the tribute by siding with the British, nullifying the treaty, and declaring war on the U.S. The U.S. was unable to act against Algiers as long as it was at war with Britain, but once the Treaty of Ghent has been signed, the U.S. sent a squadron to Algiers under Commodore Stephen Decatur. By then, however, there was yet a new Dey in Algiers, Omar who “wished to restore order after several years of political instability and was acutely aware that he could no longer count on British support against the Americans.” Decatur was able to negotiate treaties with Algiers, Tripoli, and Tunis which required no tribute. Such treaties should have been impossible according to the account of the Islamophobes, who say Muslims prefer to die and go to Paradise rather than stop their war against everyone else. Islamophobes will argue that the treaties are worthless shams, examples of “taqiyya” under which (they claim) Muslims may lie freely to the infidels. Such an argument fails to explain why those treaties, like the one with Morocco, were never broken. Pirates continued to raid French ships despite (because of?) French bombardment until the French conquest of Algeria in 1830, but no U.S. ship was captured by Barbary pirates after Decatur’s treaties. Morocco has stood by the U.S. from the beginning. Algiers broke the Treaty of 1797 at the urging of the British. The fanatical misrepresentation of the Qur’an given by the ambassador from Tripoli to explain the behavior of the Barbary pirates is the understanding of warmongers among Muslims and Westerners, but is not the understanding of Thomas Jefferson, Sultan Mohamed Ben Abdullah, the vast majority of Muslims, or the respected scholars of Islam. A neutral academic summary of the Barbary Wars in context can be found at the Oxford Islamic studies website. This entry was posted on Friday, July 21st, 2017 at 10:31 am and is filed under Dr. Ahmad's blog. You can follow any responses to this entry through the RSS 2.0 feed. You can leave a response, or trackback from your own site.